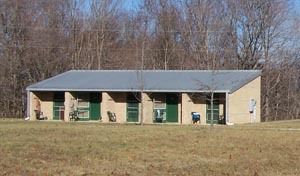 The Hamilton Valley facility is located in south centeral Kentucky just outside of Mammoth Cave National Park. The main building has a fully equipped kitchen, including cooking equipment and tableware. The great hall is quite large. Matching tables and chairs are provided. There are also 2 restrooms, each with two showers. The front of the main building is graced with a deck running the full length of the building overlooking the whole of Hamilton Valley. The view is quite lovely, and at dawn and dusk, deer may be seen cavorting in the valley below. There are 2 bunk houses next to the main building, each with 5 rooms, four bunks each. Total sleeping capacity: 40. These are heated and airconditioned. Each room contains two floor-to-ceiling shelving units for gear. Bed linens nor pillows are provided. If you are interested in using the Hamilton Valley Property, please contact Dawn Ryan , phone: 815-260-3454, Hamilton Valley Schedule Manager at least 2 weeks prior to desired use. Earlier reservations are likely to be more successful. Eligibility of Use: It is the intent of CRF to further its established goals of supporting research, education, and conservation of caves, karst areas, and karst resources. CRF Operations and Members, individuals and/or organizations involved in relevant karst or cave research, and other groups and/or individuals as specifically approved by the HV Director or CRF Board of Directors are eligible to apply for a Use Agreement. Examples of groups previously awarded Use Agreements: the NSS Restoration Camp, a hydrology class from the University of Florida, a karst class from the University of Mississippi, a teacher in-service science education workshop and a graduate student researcher. Use Agreements: All users of the property must have on file a Use Agreement. Use Agreements are established by approval of the HV Director. All candidates for Use Agreements should satisfy the eligibility requirements as specified. All organizations and individuals using the Hamilton Valley Research Center (HVRC) must have a signed Use Agreement on file that acknowledges acceptance of the terms and conditions of use by the individual and/or group. All members of each group must sign a waiver of liability to be on the HV property. It is the responsability of the Group Leader who has signed the Use Agreement to ensure that every attendee has signed one. It will be the responsibility of the Agreement holder to comply with all stipulations documented in the Agreement. The Agreement holder is financially responsible for all damage and loss of CRF property caused as a direct result of the Agreement Holder's use. Failure to pay for or repair damage and/or loss is cause for termination of the Use Agreement. 2. Notification of change or amendment: All Use Agreement holders will be notified of changes in Fee Schedules, policy and procedures changes, etc., as appropriate, including notification of dates in force for such changes. Notification will be in writing. 3. Termination of Use Agreements: Use Agreements may be canceled at any time by the HV Director if use of the Property is inconsistent with CRF goals, stipulations for use have not been observed, or a redirection in overall use is deemed necessary. Terminated Use Agreement holders may reapply in writing to the Committee for reinstatement. Once a Use Agreement has been issued, the Operations Manager will be the contact for all reservation requests and issues. Reservation requests should be made by electronic mail or phone. Only the Use Agreement holder, or her/his designee (as stipulated by the owner in writing), can make a reservation request. In some situations, it may be appropriate to consider a reservation request before a User Agreement is completed. In these situations, a reservation is considered as pending until completed Use Agreement is in place. 1. 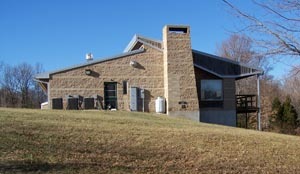 Reservation Requests: All uses of the HVRC (Main Building and/or Bunkhouses) require reservations. Reservation requests should be made to the Operation Manager no less than 14 days prior to the earliest intended use data, although every attempt will be made to accommodate last minute requests. As appropriate and as stipulated in the Use Agreement, reservations may be made for multiple dates up to eighteen months in advance. Alternative dates may be requested should the primary date requested be unavailable. 2. Priority Reservations: Some Use Agreements may be given priority on reservations (e.g.. Eastern Operations). In the event of multiple requests for the same dates, the priority Agreement will be awarded the date. However, it is not the intent to allow 'bumping' of existing reservations unless the situation is unique or affected parties can be reasonably accommodated. 3. Co-Use of Facilities: In the case of multiple reservation requests for the same dates, co-use of the facilities will be allowed, if not encouraged. This is particularly the case when small groups may be using the facility. In any event, users currently holding reservations will be notified in the event that they will be sharing the facilities. 4. Approval of Reservations: Approval of reservations will be given no later than 7 days of acknowledgment of the request and will be based upon intended use, availability of requested date(s), and scope of use. Denial of reservations will be accompanied with an explanation, in addition to proposed alternatives, if any. Upon approval of the reservation, the Use Agreement holder may be required to make a deposit (see below) if stipulated in the Use Agreement. 5. Reservation Terminations: Reservations can be terminated by the Committee for reasonable cause. Although unanticipated, facilities reserved may become unsuitable to intended use (e.g., maintenance, damage, etc.). The Committee will attempt to accommodate the interests of affected parties. 6. Cancellations: Last minute cancellations without reasonable cause may be subject to partial or full forfeiture of deposit and/or cancellation of Use Agreement at the discretion of the Director. Fees for use of the facilities are established by the HV Director and include per-person, per-day-use charges or one-time charges for groups, as established at the discretion of the HV Director. Fees will vary according to the use of the Property. Fees are subject to change at any time and Use Agreements will be subject to the currently in place Fee Schedule. Contact the director for the current fee schedule. Notification of Changes: Use Agreement holders will be notified in writing of Fee Schedule changes. Such changes will take place 30 days after the date of notification.